FX's highest-rated show has been renewed through season six, though those involved with the show assume a seventh and likely final season will be part of Sutter’s plan. 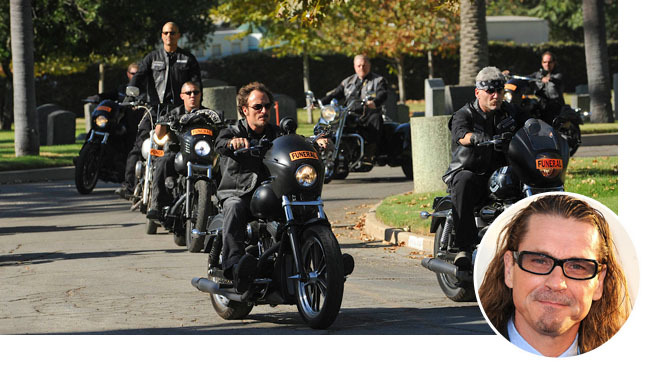 FX ratings juggernaut Sons of Anarchy is coming back for at least two more seasons. The renewal news comes as its creator and showrunner Kurt Sutter has inked a three-year overall deal with Twentieth Century Fox TV and FX Productions, which jointly produce the highest-rated series in FX history. As part of the pact, Sons has been officially renewed through season six, though those involved with the show assume a seventh and likely final season will be part of Sutter’s plan. What’s more, the deal allows the often outspoken showrunner to develop fare for both broadcast and cable, and includes a script deal with FX, where the former Shield writer is now the longest-tenured scribe. Among the advantages, the pact gives Sutter the wherewithal to map out the series’ future on his own terms, rather than at the whim of Nielsen ratings. It’s a strategy that allowed past FX showrunners from The Shield’s Shawn Ryan to Rescue Me’s Peter Tolan and Denis Leary to present a coherent show from beginning to end, noted FX Network president John Landgraf, and the intention is that that level of certainty will be helpful creatively for Sutter as well.